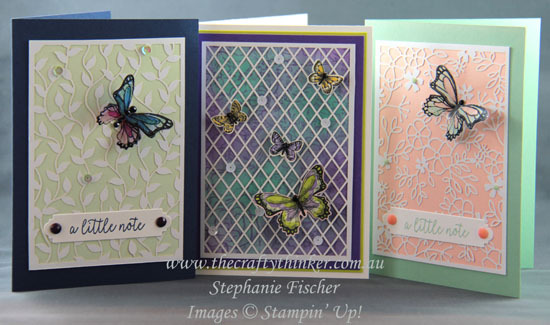 Three quick and easy cards with butterflies and Delightfully Detailed Laser Cut paper! The first one has a base of Night of Navy and a layer of Soft Sea Foam underneath the Delightfully Detailed paper. 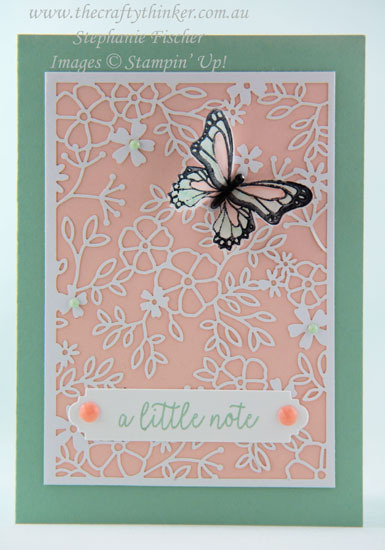 I stamped the butterfly image onto Window Sheet with Stazon ink, and coloured the other side of the butterfly with Stampin' Blends alcohol markers before punching out with the coordinating punch in the bundle (save 10% by buying the stamp set and punch as a bundle). Finishing touches are the Basic Adhesive Backed Sequins and Faceted Dots. The next card has a Mint Macaron base with a layer of Petal Pink under the Delightfully Detailed paper. 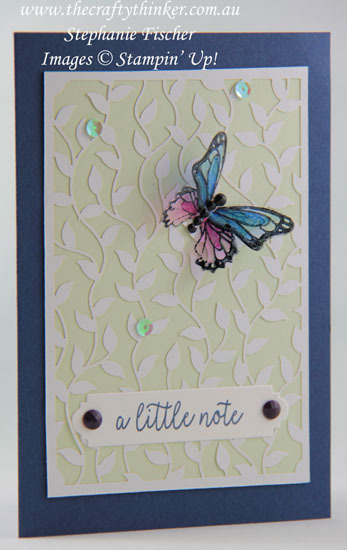 I stamped and coloured the butterfly as above but this time I also punched the butterfly shape from a piece of vellum and placed it under the coloured butterfly. For a bit of bling, I used Glitter Enamel Dots and Faceted Dots. The last card is slightly different. 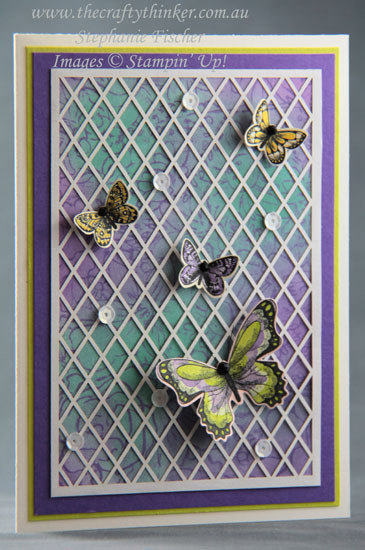 To the Thick Whisper White base card, I added layers of Lemon Lime Twist and Gorgeous Grape. I then used Pool Party and Highland Heather inks to sponge a piece of Botanical Butterfly Designer Series Paper (FREE during Sale-A-Bration with a produce purchase of $90), and place a piece of Delightfully Detailed paper on top. I then used the Butterfly Duet Punch from the bundle to punch out a variety of butterflies from other pieces of the Botanical Butterfly paper - I love how Stampin' Up! products coordinate so well! To find out more about Sale-A-Bration and how to score FREE products, click here.